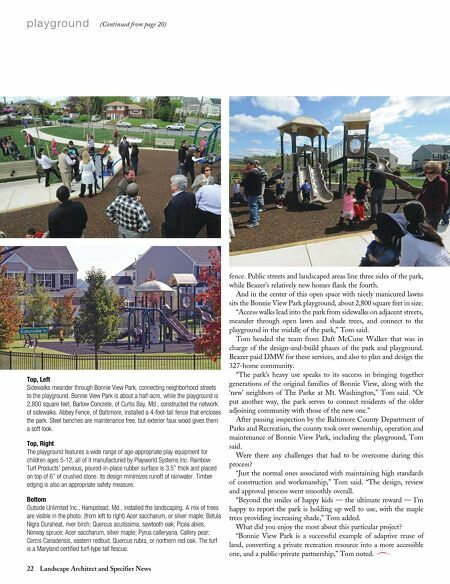 (Continued from page 20) p l a y g ro u n d Top, Left Sidewalks meander through Bonnie View Park, connecting neighborhood streets to the playground. Bonnie View Park is about a half-acre, while the playground is 2,800 square feet. Barlow Concrete, of Curtis Bay, Md., constructed the network of sidewalks. Abbey Fence, of Baltimore, installed a 4-foot-tall fence that encloses the park. Steel benches are maintenance free, but exterior faux wood gives them a soft look. Top, Right The playground features a wide range of age-appropriate play equipment for children ages 5-12, all of it manufactured by Playworld Systems Inc. Rainbow Turf Products' pervious, poured-in-place rubber surface is 3.5" thick and placed on top of 6" of crushed stone. Its design minimizes runoff of rainwater. Timber edging is also an appropriate safety measure. Bottom Outside Unlimited Inc., Hampstead, Md., installed the landscaping. A mix of trees are visible in the photo: (from left to right) Acer saccharum, or silver maple; Betula Nigra Duraheat, river birch; Quercus acutissima, sawtooth oak; Picea abies, Norway spruce; Acer saccharum, silver maple; Pyrus calleryana, Callery pear; Cercis Canadensis, eastern redbud; Quercus rubra, or northern red oak. The turf is a Maryland certified turf-type tall fescue. 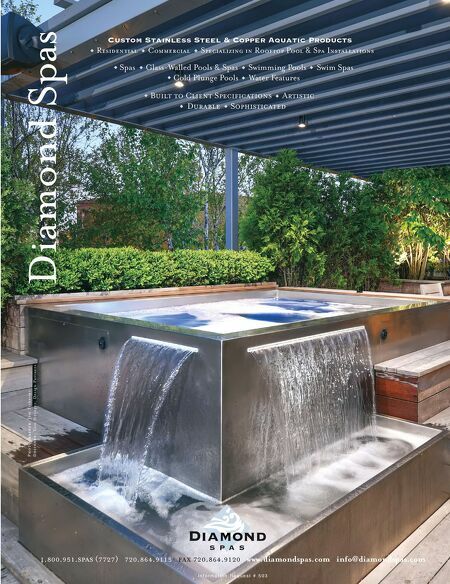 22 Landscape Architect and Specifier News fence. Public streets and landscaped areas line three sides of the park, while Beazer's relatively new homes flank the fourth. And in the center of this open space with nicely manicured lawns sits the Bonnie View Park playground, about 2,800 square feet in size. "Access walks lead into the park from sidewalks on adjacent streets, meander through open lawn and shade trees, and connect to the playground in the middle of the park," Tom said. Tom headed the team from Daft McCune Walker that was in charge of the design-and-build phases of the park and playground. Beazer paid DMW for these services, and also to plan and design the 327-home community. "The park's heavy use speaks to its success in bringing together generations of the original families of Bonnie View, along with the 'new' neighbors of The Parke at Mt. Washington," Tom said. "Or put another way, the park serves to connect residents of the older adjoining community with those of the new one." After passing inspection by the Baltimore County Department of Parks and Recreation, the county took over ownership, operation and maintenance of Bonnie View Park, including the playground, Tom said. Were there any challenges that had to be overcome during this process? "Just the normal ones associated with maintaining high standards of construction and workmanship," Tom said. "The design, review and approval process went smoothly overall. "Beyond the smiles of happy kids — the ultimate reward — I'm happy to report the park is holding up well to use, with the maple trees providing increasing shade," Tom added. What did you enjoy the most about this particular project? "Bonnie View Park is a successful example of adaptive reuse of land, converting a private recreation resource into a more accessible one, and a public-private partnership," Tom noted.